A sloped headboard and low profile footboard give this platform sleigh bed its simple style. Create a master bedroom where you can unwind after a long day and energetically start your day every morning. This platform bed sits on tapered wood block feet, shows off cherry veneers and has simple molding on the headboard and footboard. Your bedroom should be your sanctuary and with this simple and stylish bed you can create a space you love. The Martinique Queen Platform Sleigh Bed by Vaughan Furniture at AHFA in the area. Product availability may vary. Contact us for the most current availability on this product. 200-33F Queen Platform Sleigh Footboard with Slats 1 66" 5" 18"
200-33H Queen Platform Sleigh Headboard 1 64" 6" 58"
200-33R King/Queen Platform Sleigh Bed Rails 1 82" 2" 8"
Finish & Paint Options Dark warm Cherry finish. 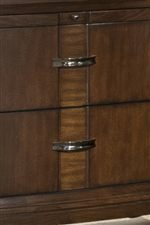 Handles & Hardware Liner drawer pulls. Case Detail Clean lines, simple molding, small arches on tops and angled feet seen throughout. Drawer / Shelf Construction French front and English back drawer construction with plywood drawer box. Case Construction Poplar solids and cherry veneers. 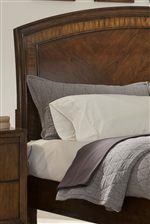 The Martinique collection brings you a great way to transform your master bedroom or update a guest bedroom in your home. Create a room with style and ample storage space with this collection. Clean lines, slight arches and simple molding can be seen throughout the collection making pieces easy to incorporate with your existing collection as well as a great fresh start. Storage drawers are great for clothing and more helping you keep your bedroom organized. Use this simple, transitional collection to create a room where you are free to relax and be comfortable. The Martinique collection is a great option if you are looking for Transitional furniture in the area. Browse other items in the Martinique collection from AHFA in the area.